At Custom Closets Direct, we design, manufacture and install closet systems and organizers for walk-in closets, reach-in closets, wardrobe units, dressing rooms, home offices, entertainment and media centers, wall units, pantries, laundry rooms, linen closets, mud rooms, garage storage systems (and much more!) to fit your exact specifications. We wanted to redo our closet to try and make some space, and hired out to these folks so we wouldn't be stuck doing it ourselves. We were amazed with what they did for us! It isn't just roomier, it's actually pleasant now. We love it! They thought of creative things we never would have considered! 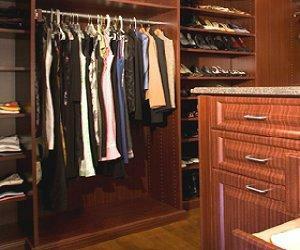 Do you have any experience using Custom Closets Direct? If so, please rate your experience and let others hear about it using the form below.